Directions: Answer these questions pertaining to polynomials. Check each answer when finished. Find the perimeter of the regular pentagon shown at the right. 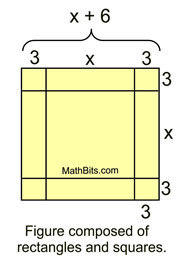 The diagram at the right can be used to visualize the value of (x + 6)2. Which choice is NOT supported by the diagram? 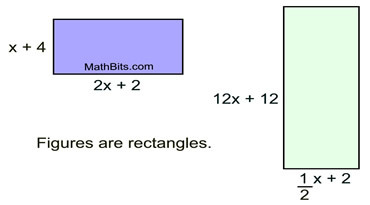 The diagram at the right is composed of a square and two rectangles. Find a polynomial expression for the total area of the figure in square units. The diagram at the right is composed of two rectangles. Find a polynomials expression for the area of the shaded (green) region in square units. 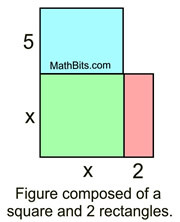 Figure composed of two rectangles. How many times greater is the area of the figure on the right than the figure on the left? 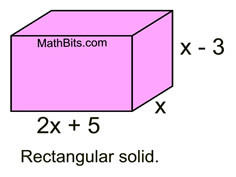 Express the volume of the rectangular solid seen at the right, in cubic units. 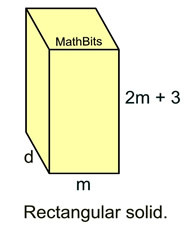 2m3 + 5m2 +3m cubic units. Which choice represents d in terms of m? The area of a circle formula is A = πr2, where r is the radius of the circle. The area of the circle at the right is given as 4πx2 - 20πx + 25π. Express the radius, r, of the circle, in terms of x.